Since 1988, Women of the Wall (WoW) has sought to pray at the Western Wall in a group while reading aloud from the Torah and wearing tallitot. Though the Israeli Supreme Court ruled in 2013 that the group has the right to pray at the Kotel according to their tradition, they still face forceful opposition from the Orthodox authority that dictates the rules of prayer at the holy site. 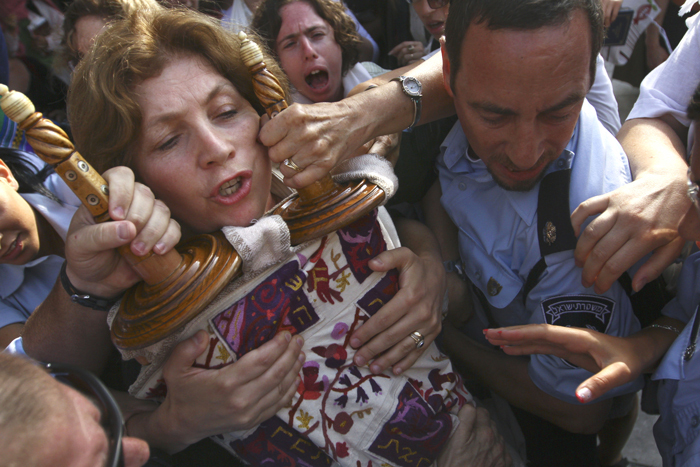 The group is back in the news in recent weeks: On April 20th, the Women of the Wall successfully read from a full-size Torah scroll at the Kotel for the first time in its history, after a group of men – subsequently attacked by male Orthodox worshippers— passed it over the mechitzah or gender barrier. Rabbi Shmuel Rabinowitz, director of the Western Wall Heritage Foundation, responded with another first: Last week, police locked the partition and set up barriers for reinforcement. In a forthcoming Oxford Journal of Law and Religion article, Yuval Jobani of Tel Aviv University and Nahshon Perez of Bar Ilan University use Women of the Wall as a way to explore the complexities of religion’s place in the public sphere. Moment spoke to Jobani and Perez – authors of the upcoming Oxford University Press book Women of the Wall: Navigating Religion in the Public Sphere — about the controversy surrounding Women of the Wall and some possible solutions. Why is the Women of the Wall issue a good example of religion in the public sphere, and why did you choose them as your example? The case of the Women of the Wall (WoW) is unusual, as it combines several issues that make it a fascinating and challenging case study for religion in the public sphere: First, it exemplifies a dramatic scenario in which religious and political establishments are faced with strong, explicit demands for gender egalitarianism; second, a portion of the WoW are Jewish-American and the strong support they enjoy from many liberal American Jews adds further complexity to this religious conflict; third, while the core group of the WoW is Orthodox, the multi-denominational membership of the group defies easy classification and undercuts simplistic solutions; fourth, the specific location—the Western Wall—is of course a highly significant holy site for observant Jews and a central location of Israel’s civil religion, and thus raises both the tensions and the stakes of the already difficult case. We were therefore attracted to this case because of the complexity and richness of the issue at hand. In fact, the more we progress in our research of this case, the more we discover further complexities and subtleties. This is why our original paper has grown into a book project we are currently working on. How much control does the State of Israel have over the Kotel and other holy places? Since 1967, Israel has had full control over the Kotel. The state ensures the security of the site, all visitors undergo a security check, a significant police presence is provided at all times, etc. It is also important to note that control over the Kotel, as well as other Jewish holy sites, is largely delegated to Orthodox authorities. The Western Wall Heritage Foundation, which manages the Wall, has been dominated by ultra-Orthodox influences and the rabbi of the Wall is ultra-Orthodox. There is also a legal framework that enables the ultra-Orthodox [to have] de facto control over religious practices at the site, via a legal prevention of offenses to religious feelings. Why is it illegal for the WoW to pray as a minyan at the Western Wall? As of September 2013 the WoW have complete legal backing to pray at the Wall’s central plaza according to their custom. This however does not mean that the WoW’s struggle is over, as on the ground, they still suffer from the opposition of the Orthodox authorities which manage the site. So, for example, they are not allowed to read from a Torah scroll. Although the WoW’s manner of prayer is not strictly forbidden by the Orthodox authorities, at least not unanimously, they are considered offensive and unacceptable by the mainstream Jewish Orthodoxy. Your article concludes that privatization of Western Wall prayer is the best approach to solving the conflict. What would that privatization actually look like in practice? The strategy of privatization in the WoW case requires that the state retreat from the religious dispute over the WoW’s prayer. The state, in this approach, will maintain peace and order at the Wall and nothing more. As the entire state-religion system in Israel is not privatized (although economic liberalism, highly prevalent in Israel, has penetrated the religious sphere), it is admittedly difficult to disconnect the WoW’s case from the rest of the relevant system. Nonetheless, some steps in the privatization approach can be taken. The privatization approach would recommend that the state eliminate all particular laws, regulations, positions, etc. that are particular to the Western Wall location. For example, the state position of the rabbi of the Western Wall would be abolished and the Western Wall Heritage Foundation would cease to exist; the permanent divider that separates men and women in the Wall Plaza would be removed (though men and women would remain free to arrange themselves according to their preferences); all legal rules specific to the Wall would be abolished. Indeed, anything that is prohibited in, for example, a street in Tel Aviv (violence, littering, etc.) would also be banned at the Western Wall, but nothing further (although disrespectful behavior would be banned as it is banned in a museum or a university library). You make note of the fact that men and women used to pray side by side at the Wall — that before 1948, there was in fact a ban on the use of a gender divider. How did we come under the impression that side-by-side prayer at the Wall is a modern invention that flouts tradition? The issue of invented tradition, which your question relates to, has in the last few years attracted quite a lot of scholarly attention. As you rightly point out, the ultra-Orthodox claim that their manner of prayer follows a specific tradition that is rooted in the past and has been transmitted from generation to generation does not match documented history. Indeed, there are numerous documents and even footage and films showing men and women praying next to each other at the Wall, with no divider, dating back to the early 20th century. In the pre-1948 era, the ultra-Orthodox could decide either not to pray at the Wall at all or to divide “time slices” between men and women; the evidence demonstrates, however, that ultra-Orthodox men and women chose to pray side by side without a gender divider at the Plaza of the Western Wall. Rather than construct an alternative “tradition” from these sources, however, we wish to argue only that it is difficult to construct any singular “custom” from such evidence (as the ultra-Orthodox insist they have successfully done). We find no particular reason to give special importance to the customs that have been in place since 1967 since these are simply too recent to connect with an established and well-known heritage. Furthermore, the WoW started their struggle in 1988 and at that point, their custom of praying became a part of the noted “varied history” of the Wall (or “custom”). Indeed, why should the brief period from 1967 to 1988 be the focal point from which other customs are examined and evaluated? It seems that there is a great difficulty in pinpointing what the local custom is, and that this difficulty is sufficient in scope to make the justification of the current arrangement at the Kotel highly problematic. Thank you for clarifying these complex issues. I look forward to receiving periodic status updates. There is really no controversy….. Israel is like Saudi, Vatican, etc a theocracy, ruled by the princes of the church… and they no matter what you call them are NOT going to give up cushy post…. Before 1948, we were prohibited from making the Kotel Plaza a formal synagogue. Now, thankfully, we can. So the norms of synagogue tradition apply now, and didn’t then. Do you wish to go back to the days when the Kotel was not a formal synagogue? why do the orthodox & ultra-orthodox, of ANY faith, make it so difficult for those who are non-believers, to express their spirtuality at sites religiously venerated? Jews are no different, unfortunately. Can it be because those orthodox & ultra-orthodox cannot tolerate the light of day?